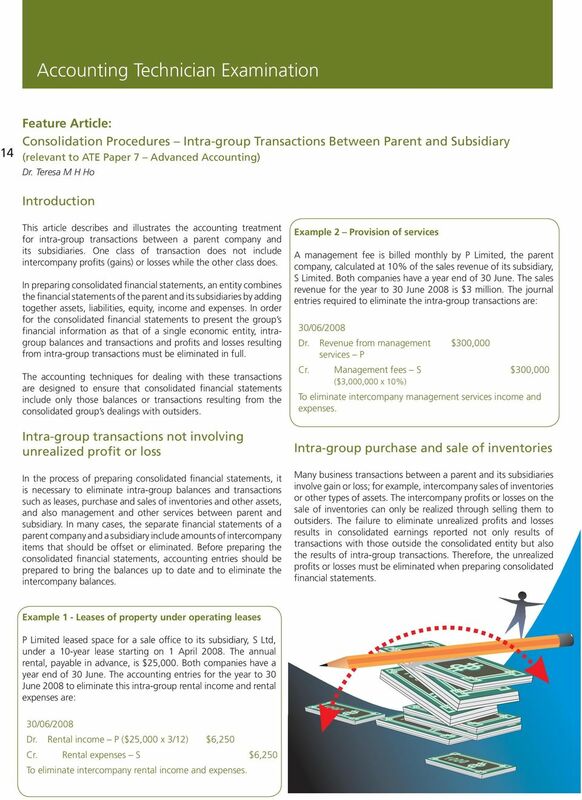 1 14 Feature Article: Consolidation Procedures Intra-group Transactions Between Parent and Subsidiary (relevant to ATE Paper 7 Advanced Accounting) Teresa M H Ho Introduction This article describes and illustrates the accounting treatment for intra-group transactions between a parent company and its subsidiaries. One class of transaction does not include intercompany profits (gains) or losses while the other class does. In preparing consolidated financial statements, an entity combines the financial statements of the parent and its subsidiaries by adding together assets, liabilities, equity, income and expenses. In order for the consolidated financial statements to present the group s financial information as that of a single economic entity, intragroup balances and transactions and profits and losses resulting from intra-group transactions must be eliminated in full. 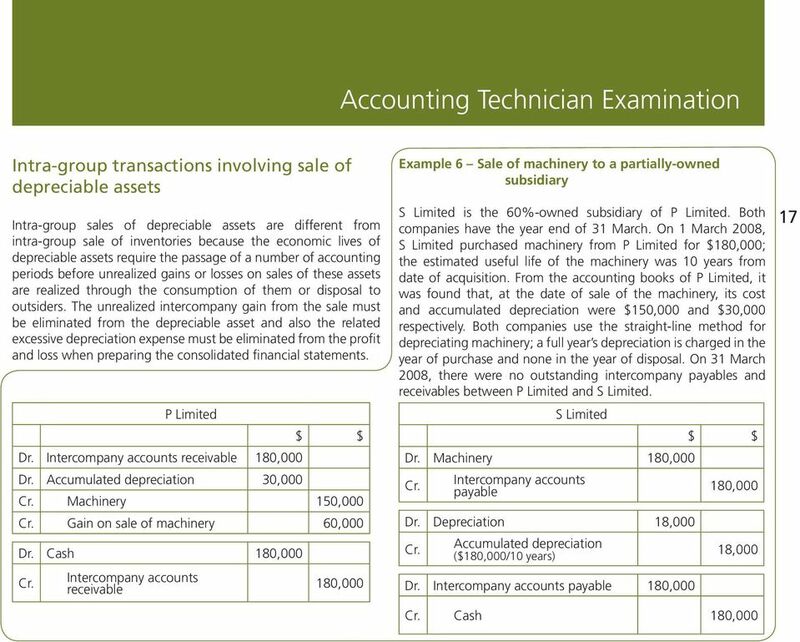 The accounting techniques for dealing with these transactions are designed to ensure that consolidated financial statements include only those balances or transactions resulting from the consolidated group s dealings with outsiders. Intra-group transactions not involving unrealized profit or loss In the process of preparing consolidated financial statements, it is necessary to eliminate intra-group balances and transactions such as leases, purchase and sales of inventories and other assets, and also management and other services between parent and subsidiary. In many cases, the separate financial statements of a parent company and a subsidiary include amounts of intercompany items that should be offset or eliminated. Before preparing the consolidated financial statements, accounting entries should be prepared to bring the balances up to date and to eliminate the intercompany balances. Example 2 Provision of services A management fee is billed monthly by, the parent company, calculated at 10% of the sales revenue of its subsidiary,. Both companies have a year end of 30 June. The sales revenue for the year to 30 June 2008 is 3 million. The journal entries required to eliminate the intra-group transactions are: Revenue from management services P Management fees S (3,000,000 x 10%) 300, ,000 To eliminate intercompany management services income and expenses. Intra-group purchase and sale of inventories Many business transactions between a parent and its subsidiaries involve gain or loss; for example, intercompany sales of inventories or other types of assets. The intercompany profits or losses on the sale of inventories can only be realized through selling them to outsiders. The failure to eliminate unrealized profits and losses results in consolidated earnings reported not only results of transactions with those outside the consolidated entity but also the results of intra-group transactions. Therefore, the unrealized profits or losses must be eliminated when preparing consolidated financial statements. Example 1 - Leases of property under operating leases leased space for a sale office to its subsidiary, S Ltd, under a 10-year lease starting on 1 April The annual rental, in advance, is 25,000. Both companies have a year end of 30 June. 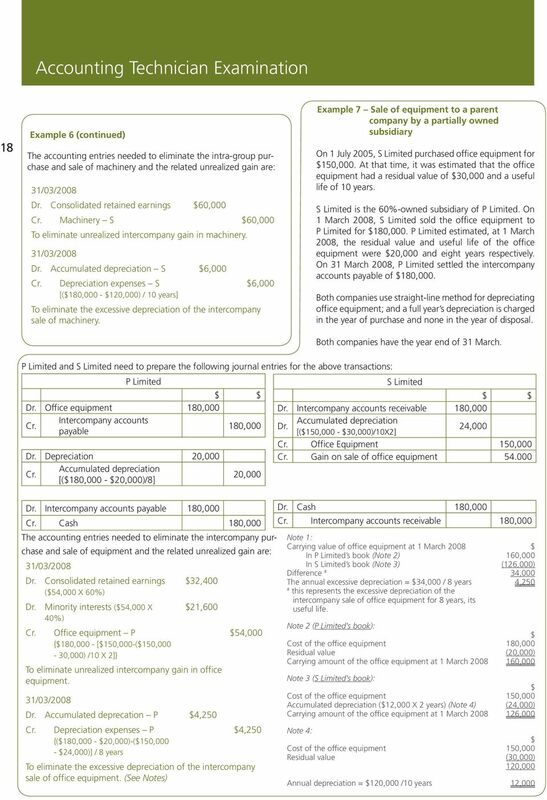 The accounting entries for the year to 30 June 2008 to eliminate this intra-group rental income and rental expenses are: Rental income P (25,000 x 3/12) 6,250 Rental expenses S 6,250 To eliminate intercompany rental income and expenses. Continuing from the article in the December 2012 issue of Velocity, we can now look at calculating a figure for PUP and how to adjust it. Consolidation-Date of Acquisition. Chapter 4. Consolidation-GAAP. Consolidation-Date of Acquisition. Roadmap Chapters 5 to 10. Residual carrying amounts and expected useful lives are reviewed at each reporting date and adjusted if necessary. 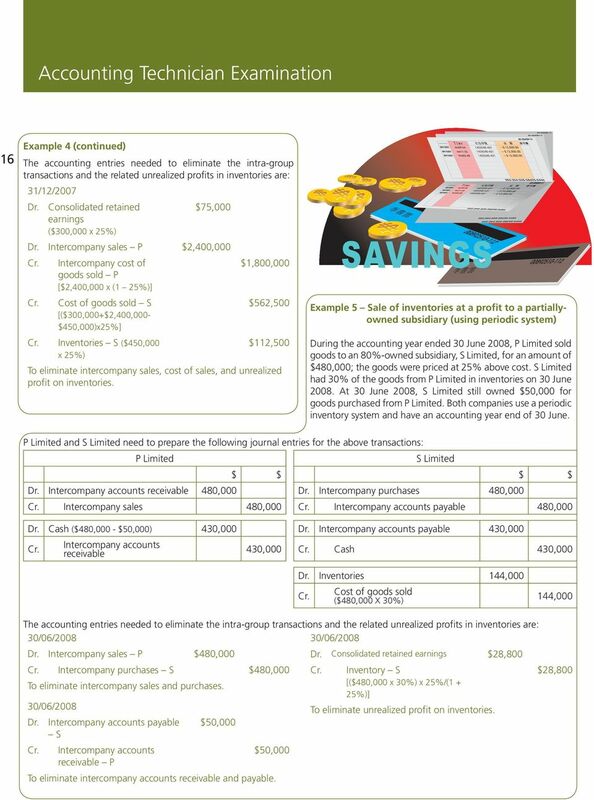 MULTIPLE CHOICE QUESTIONS ( 45 %) Lebanese Association of Certified Public Accountants - IFRS 1. Which of the following is an ethical concern of accountants? a. Earnings manipulation. b. Conservative accounting. Volex Group plc. Transition to International Financial Reporting Standards Supporting document for 2 October 2005 Interim Statement. 1. A change of classification in presentation in financial statements is a change of accounting policy (CAP) under IAS 8. ANNUAL REPORT OF CAMBRIC LIMITED CAMBRIC LIMITED Directors of the Company 1 Directors Report 2-3 Financial Statements 4-6 Notes forming part of Financial Statements 7-14 CAMBRIC LIMITED DIRECTORS: 1. Mr.
Consolidated Statement of Financial Position Sumitomo Corporation and Subsidiaries As of March 31, 2016 and 2015. Millions of U.S.
Dip IFR. Diploma in International Financial Reporting. Friday 11 December 2015. The Association of Chartered Certified Accountants. This article discusses the selection of and changes in accounting policies, changes in accounting estimates and corrections of errors.